I LOVE, LOVE, LOVE a good brownie. They are my favorite dessert, hands down. I know they aren't very fancy or elegant, but I don't care. They are down right delicious! Over the years I have had my fair share. I am always up for trying a new brownie, but I am picky! I prefer them to be fudgy, chocolaty, moist, gooey, NOT cakey, and NO frosting. Well, I finally found the absolute perfect brownie, thanks to the lovely Anita of Dessert First. She recently posted her favorite basic brownie recipe and I nearly attacked the screen. I wanted that brownie with ice cream!! It looked so delicious! I finally found time to make them this week. The search is over, the perfect brownie has been discovered! Anita you are a genius! You can jazz them up if you want...add in chocolate chips, cocoa nibs, caramel, etc.! I personally like the classic intense fudgy flavor!! Good thing we gave these to our friend for his birthday, if they were sitting around the house I would of eaten the whole pan! They are that good! Combine chocolates and butter in a metal and place over a bain-marie (pot of simmering water) on medium heat. Heat until chocolates and butter are melted and combined - be sure to stir occasionally to combine and to make sure the chocolate doesn't burn. I'm loving the look of those brownies. That's my favorite dessert too. I can already tell they'll be wonderful with the three kinds of chocolate. I love a good brownie too! I'll have to give this one a try. Thanks! Oh, that does look dark and fudgy! My son looves brownies in any shape or form. I will have to give these a go! Fudge brownies are a favorite here. These are motivational! Ooohhh. I love brownies. Love them a whole whole lot. I prefer the edges which is perfect because you could have the middle. Oh and that ooohhh, is more of a moan because the photo made my morning extra happy. These look fantastic. You'll hate me for this but I'm so glad I am not a brownie lover. I'd have 10 more lbs on me. Thankfully, one can sit on my counter and I'll walk by it 100 times without wanting it. But if I tasted those I would of course eat the whole thing & love it. Chips are just more my weakness and I'll eat a whole bag! I WILL make these though because my husband loves a good brownie. My chocolate loving daughter would absolutely go crazy for these. I guess I know what we'll be baking soon. Oh Maria these are just absolutely delicious! I love brownies too and ice cream is the best thing to have with them. Oh my goodness what divine brownies. I must give this recipe a go!! My feelings on brownies EXACTLY. Fudgy and dense please! Those look so good, can't wait to try the recipe! I'm going to have to make those for my husband. I'm having a pie party for my birthday (like I need another excuse to eat pie, right?) and the poor man needs some chocolate. I'll have to save him! Pie girl to the rescue! I can feel the weight going on just looking at them. These are a must try! You can not go wrong with brownies. I can't wait to try this. I'm excited to because I have always made brownies from a box, I know- how lame. I can't decide if I like brownies better hot from the oven or just plain old room temp-but I do know for sure I love them with a tall glass of cold milk-I have the milk, can you send me one of those brownies?? Yum, there is nothing better than the perfect, homemade brownie. I'm definitely bookmarking this recipe! I love brownies too, makes me not feel so guilty about having a hunk of cake like goodness. These look good I'll have to try them. I'm a fudgy brownie lover, so I'll take a plate full!! 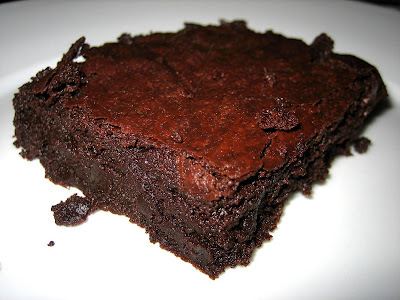 I am so happy that you have found the ultimate brownies - my hubby would love them. I ALWAYS need to give away a few brownies or we eat the entire pan in a few short days. 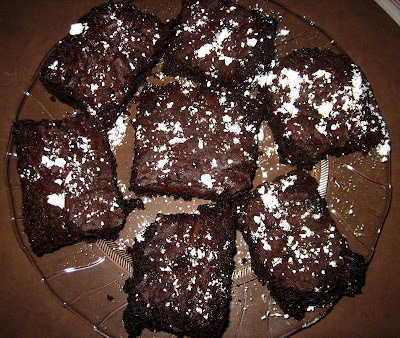 These look great and its never to late to add one more brownie recipe to my collection! I love brownies! I'll mark this one to try sometime as I've been searching for the perfect recipe for awhile now! those look so good! i will be trying this, i have been looking for a good brownie recipe too! Don't you just love when you "Find It", whatever it is? Given your rave reviews I now need to see if they are the It Brownies I've been searching for as well. Nice post! there is nothing like a good brownie. I swear the best desserts are the simplest — brownies, chocolate chip cookies, vanilla ice cream. these sound amazing! Brownies are a comfort food and those look fabulous. The search for the perfect brownie can be so endless... I'll have to try this one next. I'm still looking for the elusive perfect vegan brownie as well. They do look wonderfully rich and fudgey. I never understood the appeal of cakey brownies. I'll be trying these soon.